The issues and concerns surrounding this mine application are substantial and complex and my testimony attempts to document as many of those as I can. Rather than burden the public hearing with a complete reading of this document (which is quite long), I only ask that this introduction be read into the record and the Attachments to this testimony be included in the public record by reference. The testimony I’m submitting today is intended to assist the Board of Adjustments advance both of those goals. Indeed, I do not oppose sand mining in Buffalo County. Rather, my goal is to see an open and transparent process find an approach to this business that can be supported by all stakeholders, rather than continuing the non-transparent “win/lose” conversation which pits the needs of the few (sand miners and their associated businesses) against the needs of the many (residents and businesses in the “River and Coulee Country” that makes up substantially more than half of the land-area of the county). My hope is that this application will be denied today, that the applicant for the permit to operate this mine will be encouraged to enter into an open and transparent conversation with other stakeholders, and that the resulting proposal can be one that everybody can testify in favor of. As a contribution to that goal, I have started a web site (www.FracSandFrisbee.com) and an email list server that is open to all participants who are interested in working on finding constructive solutions to the issues I’m raising here. I invite all who read this to join that conversation. Documentation that this application will not generate any local negative tax, fiscal and economic, municipal, and resident concerns, including financial Assurances to allow proper and timely closure and reclamation. I request that the application be withdrawn or denied if it does not include documentation of this type. If the application is resubmitted in the future, I request that it include this documentation and that the documentation be made available to the public at least 30 calendar days in advance of the first public hearing of the application to allow sufficient time for review and comment by affected stakeholders. If the Board of Adjustments decides to approve the application in the absence of this documentation, I request that immediately after that decision the Board verbally state for the record their justification for proceeding with that decision and that they publish a public written summary of their justification within 14 calendar days. If the applicant has not addressed these issues, I request that the application either be withdrawn or denied. If the application is resubmitted in the future, I request that the application include documentation as to how these issues will be addressed and that the application be made available at least 30 calendar days in advance of the first public hearing in order to allow sufficient time for the public to review and comment on the proposals. If the Board of Adjustments decides to approve the application in the absence of plans to address these issues, I request that immediately after that decision the Board verbally state for the record their justification for proceeding with that decision and that they publish a public written summary of that justification within 14 calendar days of their decision. Attachment C provides a series of maps which describe the regional land-use issue that is created by mine permits that are granted without considering the impact of transportation modes and routes on the county through which they pass. Our county is divided between the scenic, recreational “River and Coulee Country” in the southeastern 4/5ths of the county and the more industrial and agricultural “Sand Country” in the northeast. Much of the concern about these mines arises from the impacts that are felt by property and business owners who live and work in the area when haul routes and rail transfer facilities are either passing through, or located in, Coulee Country. Deny this application and request that two applications be submitted to replace it — one application to address the mine, the other to address the proposed processing plant (which, if approved will create pressure to transport sand through “Coulee Country” for decades and perhaps generations to come). If the application are resubmitted in the future, I request that prior to resubmitting the application the mine operators actively engage all interested stakeholders in an open, transparent, good-faith effort to arrive at a solution to these issues that is at a minimum acceptable to all — rather than continuing the “win/lose” dialog that characterizes the process to date. If the Board of Adjustments decides to approve the application, I request that immediately after that decision the Board verbally state for the record their reasons for proceeding with that decision in the absence of plans to address these regional land-use issues and that they publish a public written summary of that justification within 14 calendar days of that decision. I am concerned that the current process to grant permits for frac sand mines does not achieve an appropriate level of due diligence to assure that the County is properly evaluating industrial frac sand proposals before granting conditional use permits. 6) Provide documentation demonstrating that this application will not generate any local negative tax, fiscal and economic, municipal, and resident concerns, including financial assurances to allow proper and timely closure and reclamation. In addition to the impact on the sub-standard Praag Valley Dugway portion of Highway 88 high volume industrial frac sand mining may cause significant public safety concerns on other and local roads throughout the region. Of special concern is the impact of a large volume of truck traffic on river towns such as Nelson, Alma and Fountain City. State Highway 35 becomes the main central street of each of these towns. There are generally few crosswalks in the central business districts of these towns because of the press for parking spaces for local businesses. The addition of high volume sand-truck traffic to this mix may cause significant risks of accidents and fatalities in those areas. Unfortunately, all of our “river towns” are constrained between the bluffs and the river – there’s nowhere to go if one were to consider building bypasses to route traffic away from downtown areas. Sand trucks will share state highways with school busses, farm equipment, farm animals, recreational vehicles and all manner of pedestrians. The increased volume of traffic, coupled with aggressive driving motivated by tight schedules and “per load” rather than “per hour” compensation plans for drivers, may produce higher risk of collisions and fatalities. Buffalo county roads are a favorite of tourists, birdwatchers, motorcyclists, bicyclists and others who enjoy the scenic beauty of the region and congregate at the many local businesses. Sand trucks operating at or above the speed limit may cause safety issues as they encounter unwary or erratic drivers who may make frequent stops, park on narrow shoulders, drive slowly and erratically and are in general not driving in a predictable way. Highway 88 is a school-bus route with over 30 sub-standard sections indicated with sharp-curve, blind corner, no-passing and reduced speed signs and markers. One single school-bus crash is one too many. Highway 88 is considered a “low-collector” farm to market road by the DOT. It has zero controlled intersections and numerous blind entrances in the stretch that is being proposed for hauling. In fact, the DOT and the County have recently been in conversations about converting Highway 88 to a County road, partly for this reason. Highway 88 is a favorite route for motorcyclists during the summer months — unfortunately sometimes meeting with accidents on the Praag Valley dugway. There was a fatal crash on June 10, 2010. Highway 88 is used to move farm equipment from place to place — trucks will encounter combines, sprayers, large tractors and silage wagons during farming season. Given the number of blind corners, sharp curves and short sight-lines along much of the road, many of these encounters are likely to be quite sudden and may not provide sufficient time to react. Conversations with DOT representatives confirm that the pavement on Highway 88 is in very poor condition — largely because the road carries so little traffic that it’s hard to justify repairs. Thus, if mine operations start running trucks over the road, it will have to be repaired almost immediately. When pavement is repaired, there are no suitable detour routes and in may places no shoulders or passing areas, so the road will most likely have to be done in short sections with flagging, moving the work zone so that one lane is viable during the project. Thus it’s likely that the project would be done in multiple phases. This will cause significant delays, considerable expense, and safety issues along the whole route and especially on the Praag Valley Dugway. Public Nuisance concerns including dust, noise, traffic congestion, odor, blasting, drilling, light pollution and erosion. Open-pit extraction of frac sand may cause erosion and runoff that damages local streams, waterways and groundwater. Several residents of the Praag Valley portion of Highway 88 have expressed concerns about engine braking, especially on the steep turns leading off the Praag Valley Dugway. Local residents have raised wind borne dust as a concern. Sources include blasting, uncovered sand piles, routine mining operations and uncovered (or partially-covered) trucks. Highway 88 runs through an extremely narrow valley, which will tend to concentrate the impact of truck dust. Impacts may be felt in fragile natural areas as well as residents’ homes located close to the road. The applicant may not have sufficient assets at the time of closure to complete promised closure or reclamation activities. Much of the property value of rural lands in the “Coulee and River Country” part of Buffalo County derives from the quiet beauty of the area. The transformation of area roads into transport corridors and/or a transportation hub for industrial sand mine trucks may dramatically reduce the value of those properties. Many businesses in the county are here to serve the needs of tourists and occasional residents who come here to enjoy the recreational opportunities of the region. The value of those businesses – both property value and ongoing revenue – may be dramatically reduced by the addition of frac sand trucks, perhaps to the point where some of those businesses are no longer viable. Much of the property value along the Praag Valley portion of Highway 88 derives from the quiet beauty of the narrow twisting valley. Property owners are already indicating that they will sell if that is disturbed by high volume truck traffic. Highway 88 runs along fragile wetlands and sedge meadows — with the attendant concerns about the impact of dust on native habitat and surface water and additional concerns about habitat loss if the road needs to be rerouted in order to handle heavy truck traffic. Buffalo County is home to a number of threatened or endangered species – both plant and animal. 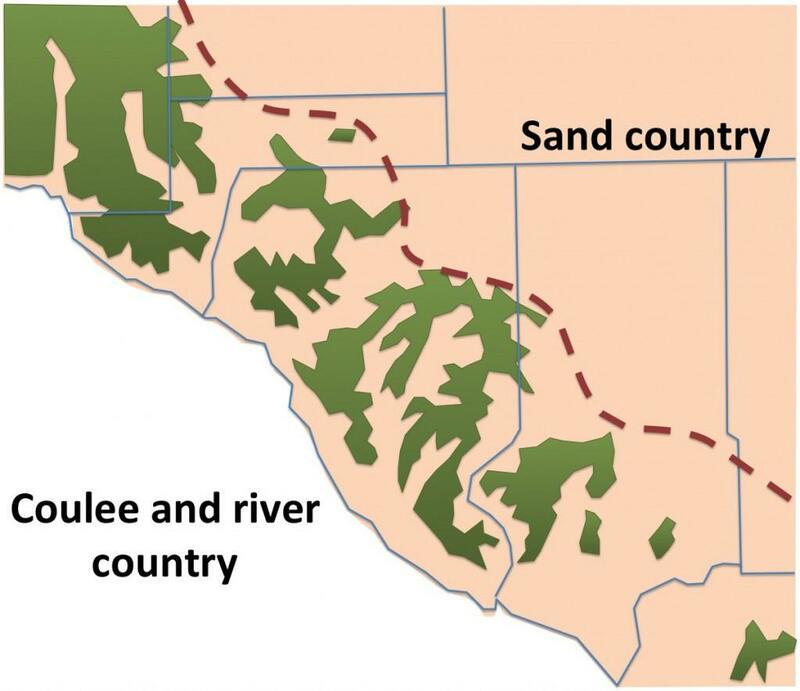 The impact on these species could be quite substantial through habitat loss, stress, dust, traffic, groundwater and surface water pollution and other results of industrial frac sand mining and transportation in “Coulee and River Country” areas of the County. Highway 88 runs immediately adjacent to a trout stream. Ratings vary from Class 3 up to Class 1 at different points along the proposed haul route. In many places the valley is so narrow that it may be impossible to find suitable land to acquire if the road needs to be rerouted to handle high-volume truck traffic. Highway 88 runs along several fragile wetlands and sedge meadows with a number of Wisconsin Rare Plant and Animal populations, again raising issues with relocating the road if required to handle high-volume truck traffic. This a series of maps which attempts to describe the regional land-use issue that is created by mine permits that are granted without considering the impact of transportation modes and routes on the county through which they pass. The southwestern portion of Buffalo County is primarily scenic river and coulee country where the focus is on recreation and tourism. In the northeast are the rolling sand hills that actually extend across much of central Wisconsin up into the northwestern lakes region where the economic emphasis is more on agriculture and small industry. This map shows the proposed and approved haul routes from the sand mines in the county. This is why the Board of Adjustments needs to consider haul routes in addition to conditions immediately adjacent to the proposed mines. The implications for a very large proportion of the county are enormous and need to be considered when granting mine applications. How are the needs of the many (residents and people who work in Coulee Country) balanced with the needs of the few (mine operators and the businesses that provide them services)? What happens when one of the destination rail-loading locations reaches capacity? Winona officials have already told local residents that the switching facility in Winona is at capacity and that they can’t load any more trains there. Does the traffic all divert to Wabasha? What are the impacts on towns along those routes as traffic patterns change? 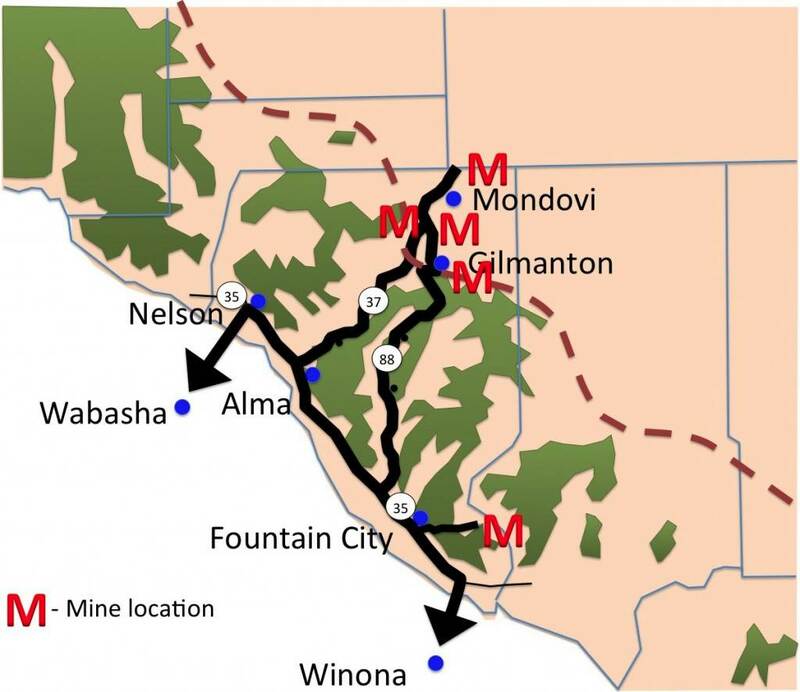 What is the implication of locating processing facilities at the applicant location – doesn’t this effectively “lock in” Highway 88 as the preferred haul route for sand out of that plant long after the actual mining at the site is completed? Loading Highway 88 with extra truck traffic for 5 years is quite a different thing than setting up a scenario what that route would be used for decades or even generations. When do “the many” get to participate in a process to try to arrive at a solution to this problem? Isn’t the charter of the Board of Adjustments to look after “the public interest, the purpose and intent of this ordinance and substantial justice to all parties concerned”? How is this goal met by a pell-mell rush to approve a mine without taking the time to put the impacted parties together in an open, transparent way to try to work out a solution that is acceptable to all? This map shows how the stakes in this win/lose conversation get even higher if the Coulee Country moves from being a transportation corridor to being a transportation hub and processing center. Purchase agreements for land to build a rail spur and processing facility at the intersection of Wisconsin highways 88 and 35 are already being put in place. If that facility goes forward as planned we not only become the transit provider for local sand, but regional sand will start flowing into the county as well. 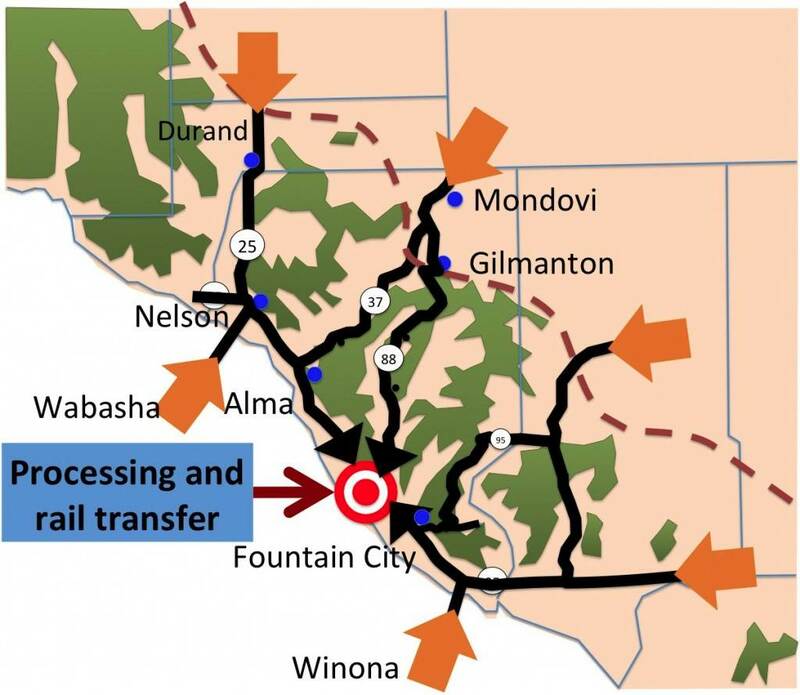 With “across the river” rail transfer facilities reaching capacity, what are the implications for communities along the Highway 35 corridor if Buffalo County becomes a rail-transfer option on the Wisconsin side of the Mississippi? Will Buffalo County become a destination for sand mine operations in neighboring counties as well as mines located here? Again, what is the point at which it will be decided that the roads through towns like Alma, Fountain City and Nelson are at capacity? Who will make those decisions? How will they be decided? How will they be enforced? Will there be any way to limit traffic to a predetermined level if much of the transportation load is generated outside the county? If the applications are resubmitted in the future, I request that prior to resubmitting the applications the mine operators actively engage all interested stakeholders in an open, transparent, good-faith effort to arrive at a solution to these issues that is at a minimum acceptable to all — rather than continuing the “win/lose” dialog that characterizes the process to date.